Meticulously maintained 3 bedroom, 2 1/2 bath, mini farm. Peaceful country living and move in ready with all appliances included. Large covered front porch and rear decks provide plenty of space to entertain or just relax. Freshly painted interior, loads of character, and fully finished basement with kitchenette. HUGE Bonus room above garage with new drywall and paint. Would make a perfect home office, media room, play room, just unlimited options for this space. Bring all your pets, large and small here. 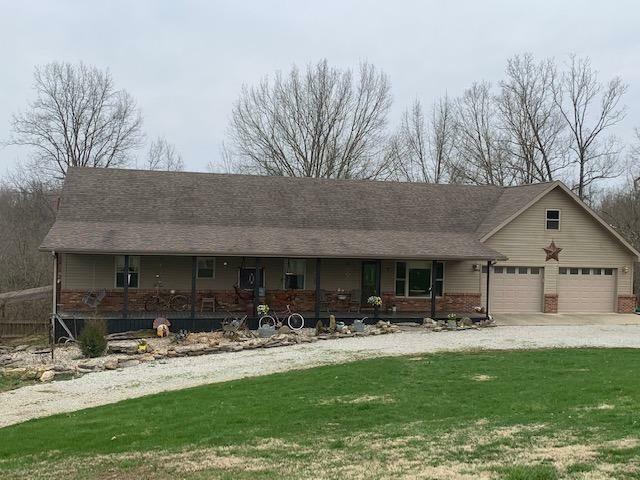 Beautiful 6 stall wood barn with large loft, tack room and all the convenient amenities to tend to your furry friends.Paddock area with board fence and property enclosed by woven wire. Several outbuildings for equipment storage and supplies. Make an appointment to see this one TODAY! Madison’s downtown historic district contains over 1,500 19th century structures listed on the National Register of Historic Places, making it Indiana’s largest historic district. Nestled along the Ohio River Valley, Madison has always been the center of transportation, industry and commerce for the entire southeastern Indiana region. Founded in 1809, Madison today is the county seat for Jefferson County, making it the destination for political, economic and social activities of the county. Boats and barges still pass on the great northern bend of the Ohio River, surrounded by scenic limestone bluffs. While much of the surrounding southern Indiana region is fertile farmland, 1300 residents have found a home in this charming tree-covered Indiana city. Madison is a scenic 75-mile drive from Cincinnati through rolling rural countryside, following US Rt. 50 to State Rt. 421. Indiana Rt. 56 also bisects the downtown. King’s Daughters Hospital and Health Services provides medical care to Madison residents and five other nearby counties. Madison is also known as an antique shopping destination in the Midwest. Numerous specialty shops, unique restaurants and quaint B&B’s compliment the historic downtown. Most Jefferson County residents come here to shop for all their food and retail needs. Madison has been called the ‘”Prettiest Small Town in the Midwest” by the Ladies Home Journal. There’s always something to do in Madison. Art festivals, historic sites and homes, museums, theater, music, entertainment, and numerous local craftsmen and artisans fill the days with activity. Southern Indiana is also a nationally recognized wine region and three award-winning wineries are located within minutes of Madison. Hanover College is the oldest private college in Indiana and offers sports and cultural activities throughout the year. Boaters use the waterfront access to the Ohio River for water sports. Annually the Madison Regatta hosts a nationally ranked hydroplane-racing event. Whether you are an avid wildlife watcher, hiker, or simply enjoy the great outdoors, Clifty Falls State Park has something for everyone. Hikers can enjoy trails ranging from “easy” to “rugged” and behold deeply cut gorges, sheer rock walls and plunging waterfalls. Located on 50,000 acres five miles north of Madison (on the closed Jefferson Proving Ground), Big Oaks National Wildlife Refuge Area is managed by the US Fish and Wildlife Service. Big Oaks NWR has been designated as a Globally Important Bird Area because of its value to migratory birds. Portions of the refuge are open for wildlife observation, photography, fishing, hunting, interpretation, and environmental education. This listing courtesy of, North Star Realty, Inc .